Twenty minutes to midnight and my boys and I are just back from our annual New Year Eve's dinner with our friends (hubby is out of town on a trip - such is the life of an airline pilot!). What a great night we had. Japanese steakhouse, white elephant exchange (don't even ask what the items were! ), fireworks and fun. We are so blessed! Happy New Year everyone! Thanks for a great year! My only resolution is to be back at the exact same place with the exact same people next year! If that happens I will be a happy woman! A couple of weeks ago my mother sent all of her children a letter in her Christmas card announcing she would not be buying any of us gifts this year; spouses and grandchildren included. No, she wasn't mad at us or stumped as to what to give us this year. Her letter explained that she loves us all very much, is very proud of us and extremely thankful that we are all so abundantly blessed. She went on to explain that her heart was telling her the right thing to do was to give the money she would have spent on presents for us to those less fortunate this holiday season. When I read the letter to my boys, ages 12 and 10, I wondered what their reactions to the news would be. Would they be disappointed there wouldn't be a new video game or a jersey from their favorite team under the tree from Grandma this year? Or would they understand the message in my mother's heart? After I finished reading the letter they both looked at me, and without missing a beat said "Grandma's right, we are blessed. That's a great idea." My heart was thankful for my mother's giving spirit and for teaching my children the true meaning of Christmas; it is better to give than to receive. My friends are a little concerned about me. We went out for our annual peeps dinner last night (Big, fat, fun!) and more than a couple of my girlfriends are freaking out because I really haven't done much Christmas shopping yet. What's the hurry? There are still three FULL days of shopping left. I do best under pressure and I'm sure I'll find the perfect gifts! Besides, how hard can it be to find fruitcakes for everyone on my list? It's one stop shopping! Well I tried my best to take some good photographs of my decorations but I'm definitely not a photographer! I tried reading the camera manual for some tips but quickly put that away (too much left brain thinking was required for this right brained girl!) and I may still have a friend help me take some better pics but until then I decided to go ahead and post what I've got. I'll start with the living room today. You may remember from a previous post I was having trouble finding inspiration for this year's decor. I resorted to praying to the decorating Gods (to no avail) and procrastinating with the hope something would just come to me. I eventually wandered outside to pick up sticks in the yard and that's when inspiration struck. I decided I would take the largest branches I found, bring them into the house, and somehow find a way to decorate with them. I thought it would be really cool to hang simple ornaments from the branches, add some sparkle, a few lights and see what happens. I really like the results but I don't think it shows well in the pictures. This is a picture of my two boys from last Christmas that I have on an antique ice box just inside the foyer of my front door. I clipped the berries from a bush in the backyard, added some greens and magnolia leaves and a simple burlap bow. Continuing on into the foyer, this is the view to the left into my living room. I LOVE Cheetah fabric and have yards of it draped as a portiere to frame the door and add a little drama before entering the room. My living room is a really dark chocolate brown, with taupe furniture and icy blue accents. 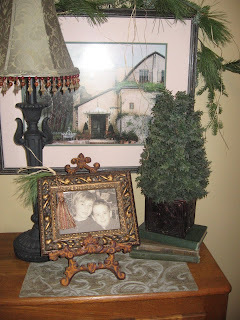 I decided to play off that theme by adding burlap to the end tables, more evergreens and combining those elements with things I display every day. I got the gold mirror for free at an auction on Maryland's eastern shore because no one wanted it, the old pocket watch dangling from the lamp was picked up at an estate sale for a couple of dollars. The old photograph and trophy cup were picked up at a flea market. Another end table in the living room, with found objects, greens, old sailing cups picked up at an estate sale. Now for the sticks, branches, twigs, etc. I wanted to add a little drama behind my sofa so I placed three old mirrors I had around the house (again, picked up at estate sales or auctions) on the sofa table, and stuck large branches into florist foam I put inside an old trophy, and then added the glitz: chandelier crystals, a crystal swag, sparkly ornaments in bronze, gold, and cream. I also added some pictures I had. On the left is the classic Blue Boy (found at a barn sale) and on the right, a much more solmen lithograph of a woman praying I bought at an auction. I liked the contrast between the two figures. I love big clocks and have four or five of them in my house. 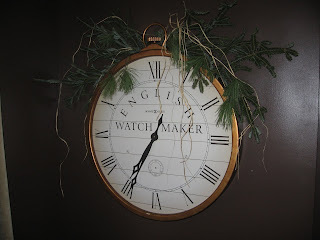 This one is in the living room so I draped it with some evergreens and added a couple of ornaments. For the typewriter which sits on an old trunk, I typed the words to the classic "Yes, Virginia, there is a Santa Claus...." article that was originally published in the New York Sun in 1897 and added an old passport, greens, and sparkly snowflake for a little glitz. I'll post more of the decorations tomorrow. 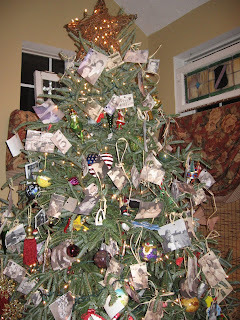 In my last post I told you my favorite part of decorating for Christmas is finding the perfect tree. My least favorite part? Putting on the lights, no doubt about it. Now my husband has pointed out (ad nauseum, I might add) that if we had a pre-lit artificial tree I would have gotten to the actual decorating part of the tree hours ago. Of course, I dismiss the very thought of it, remind him of the Meenachan family tradition of big, beautiful real trees and get back to the task at hand. It was always my family's tradition to pile the six of us into the car a couple of days before Christmas to go out and find the family tree. It wasn't an easy task because we could never agree on which of the hundreds of trees was the perfect tree. We all knew the criteria though: it had to be the biggest, best tree in the entire forest, and no one was satisfied until we found it. The problem was everyone's vision was different and we all had an opinion on each other's choice of a tree; It was either "too tall, too skinny, too bare, too Charlie Brownish". Usually family consensus came shortly after our toes and fingers started to freeze from walking around in Ohio temperatures too long. Once my husband and I had kids I knew I would continue with my family's tradition. My husband had other ideas. He's the guy that would happily go to Target and buy an artificial tree if I let him. Well that's not going to happen! There's tradition that needs to be followed! Picking out our tree is my favorite part of the holiday preparations. My husband (reluctantly), kids and I usually head out to the country to find the biggest, fullest tree we can to cut down. One year my husband was on a work trip (he didn't seem too upset to miss the tradition that year!) and my kids and I had to go get the tree without him. On the drive to the tree farm I regaled them with stories of all the trees my family had growing up, reminded them of their roots and explained there was tradition that had to be followed and it was not to be taken lightly. I told them how my family was famous in our neighborhood for always having a Christmas tree that practically filled the whole room. It didn't matter that our living room wasn't large and a small tree would have been better. We were the Meenachans; Meenachan's didn't do normal size trees. Well my kids didn't waste any time following that tradition. I am not kidding you when I tell you the tree we cut down required three men to hoist it to the top of our van for the trip home. I could barely see out the side windows because the branches were hanging so far down off the roof. It was fantastic!! We were laughing at all of the puny trees we saw on the roofs of other cars, thrilled that our tree was bigger than any other we saw on the way home. Turns out that tree was so huge we couldn't fit it in our front door. (I was secretly thrilled and knew the Meenachan's would be proud of me!) After many failed attempts to fit the tree through our front door a friend literally had to cut it in half so we could get it in the house. We used half of it as a tree and the other half for wreathes! You can't fight tradition when it's in your genes! My second favorite part of the Christmas tree is decorating it. This year's choice is sitting in the stand waiting for the lights and ornaments. Hopefully it will be decorated by tomorrow evening and I'll post photos of it then. I remember when I was a child we didn't buy our tree until a couple of days before Christmas. (No one ever dared to mutter the word "artificial" in front of my dad let alone think about buying a fake tree!) Now it seems like I'm way behind in decorating for the holidays because many of my neighbors already have their lights up and their tree aglow in their front window! I can't decide whether they're organized or rushing the season just a wee bit. I'm not too worried about it though, because if I am behind the rest of the world, that's okay, because I work best under pressure. We're hosting our annual Christmas party on the 13th and I can guarantee I'll still be decorating hours before the party starts. That's when my creative juices kick in. I'm not a good planner so I work best in panic mode! I have started thinking about how I'm going to decorate but who knows how it will turn out until I get started. 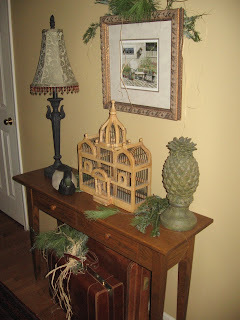 I like to decorate with natural materials, lots of evergreen branches, berries, pine cones, grapevine and other things I can find growing on the side of the road. (My husband calls it weeds!) Here's a peek at what I did last year. 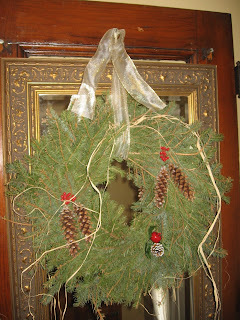 I hung this wreath on a mirror I placed on top of an old door I have in my foyer. The door is from my childhood home (mom still lives there) and it sat in her garage for about 25 years after they got a new door. A couple of years ago I asked her if I could have it and the next thing I knew she was loading it in my van! I love it because it's a piece of my family's history and it's a great conversation starter! I have a thing for clocks and I'm sure it has something to do with how I feel like life is going by way too fast! The clocks remind me to slow down. It also helps that none of them actually work so I have a false sense of a slower pace! Our tree is always my favorite part of my decorating. I'll tell you why in my next post.